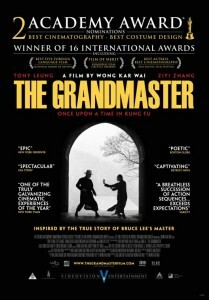 Films about martial arts have a niche market audience, but in this beautifully orchestrated and visually rich tale of Ip Man, the Grandmaster of Kung Fu, director Wong Kai Wai provides an extraordinary blend of history, action and breathtaking beauty in his groundbreaking cinematic spectacle The Grandmaster. 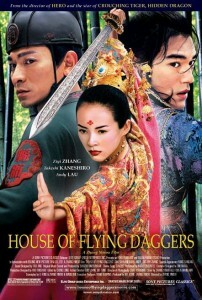 Featuring Asian martial arts stars Tony Leung (Hero, Lust, Caution) as Ip Man and the poised and gorgeous Ziyi Zhang (Memoirs of a Geisha, House of Flying Daggers) as Gong Err two opposing grandmasters who first encounter each other in a lavish brothel, The Golden Pavilion and who display their unique Kung Fu skills and also an enduring love for each other. Gong Err has to contend with her father’s legacy and the rivalry of an adopted brother known as The Razor played by Chen Chang who threatens to usurp her position as head of the family home in 1930’s Foshan, China following the proverb of a tiger who never abandons his mountain. In this case honour trumps defeat. As the action seamlessly follows these three characters, the historical narrative moves from Foshan in 1936 through the Japanese invasion of China to post-war Hong Kong which becomes the haven for contemporary Kung Fu in the 1950’s. Ip Man incidentally becomes the Grandmaster of Martial Arts star the legendary Bruce Lee who revolutionized martial arts films in the 1960’s and 70’s. 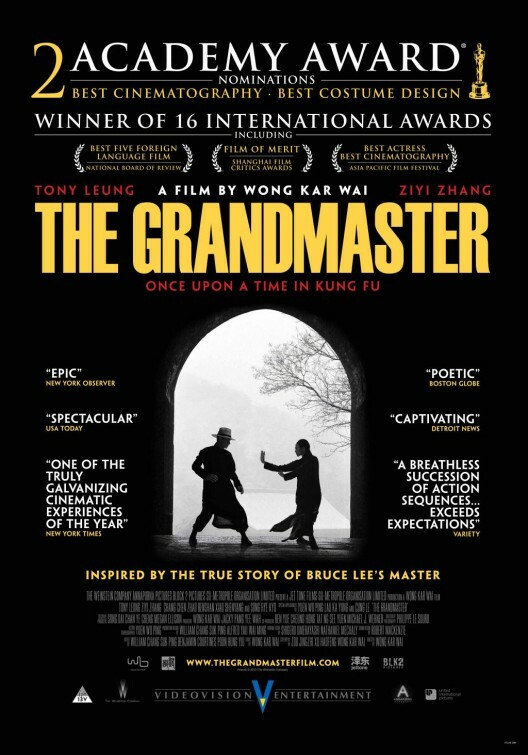 Director Wong Kai Wai’s sumptuous tale of the evolution of Kung Fu is gorgeously told in The Grandmaster with breathtaking cinematography by Philippe Le Sourd who deservedly got nominated for a 2014 Oscar but lost out to Alphonso Cuaron’s film Gravity. The intricate Oriental costumes of 1940’s China are superbly evoked in The Grandmaster which also got a nod for Best Costume Design but lost out to The Great Gatsby at the 2014 Oscars. One particularly memorable scene comes to mind when Gong Err is attending her father’s lavish funeral march as she encounters the followers of the Razor on the icy plains of Northeastern China all beautifully attired in crisp white funeral robes. The Grandmaster is both a martial arts film but also a historical account of the fortunes of the two central Chinese characters as their lives are disrupted by the invading Japanese and both are forced to flee south to the safety of Hong Kong. 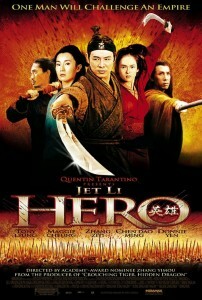 Memorable scenes include the Chinese New Year fight sequence at a train station between the unflinching Gong Err and her adversary and the opening sequence of legendary Ip Man as he swiftly defeats a gang of rivals in a rain soaked Foshan alleyway. As the opening film of the 2013 Berlin Film Festival http://www.davidrwalker.co.za/2013/05/2013-berlinale/ The Grandmaster is authentic Asian cinema at its best, with Chinese dialogue and English subtitles along with flawless visuals and wonderfully elegant fight sequences to rival directors Zhang Yimou (Raise the Red Lantern) and Ang Lee (Crouching Tiger, Hidden Dragon, Lust Caution). This is highly recommended viewing especially for film enthusiasts and lovers of authentic martial arts cinema in the tradition of Hero, House of Flying Daggers and Crouching Tiger, Hidden Dragon.